Fourteen police officers have been shot and killed in 2018. Seventeen children were shot and killed yesterday. By the numbers, parents have more to worry about in terms of their kids coming home safe than the families of police officers do. No one should be shocked. The shooter was described as a troubled kid who was obsessed with guns and for a wide variety of disturbing and inexplicable reasons- the shooter clearly had access to high-powered weapons. The kids knew who the shooter was before the police did. 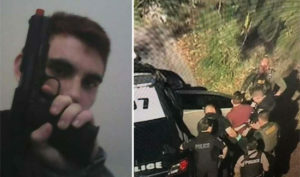 One student took to social media claiming Nikolas Cruz had serious mental health problems which were ‘ignored by all the adults’. ‘He literally had an Instagram where he posted pictures of animals he killed gruesomely and he physically assaulted one of my friends once,’ the student added. “Now is not the time to talk about gun control,” are what the folks that plan to do nothing about this at all are saying. We could put all that P.C. nonsense aside and take action but if we couldn’t go it after Sandy Hook there’s a real question about whether or not we have the courage or will to do much of anything to protect our kids. It will happen again. Maybe tomorrow, maybe next week or next month. The writing is on the wall- literally everywhere. Check out this headline from yesterday. 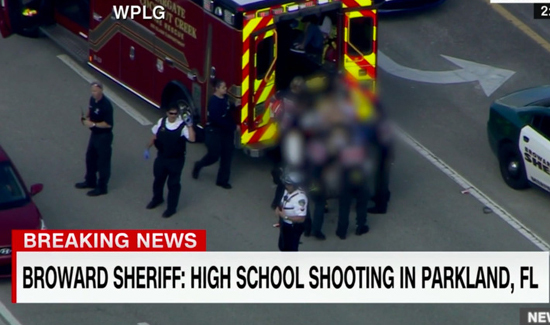 For details on the latest mass shooting in the Land of the Free, click here.